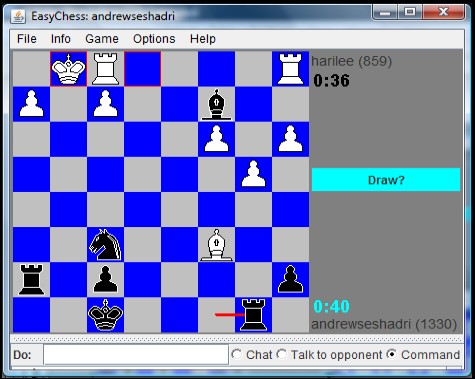 The project was about developing a chess engine in Java given that the all the scoring mechanisms are already set. The whole point was to calculate the best move through the game tree as fast as possible. We have applied Alpha-beta pruning and made the program to iteratively calculate the tree level by level. In addition, by making the program to learn all the previous wining moves, our engine gradually improved every game. At the end, we have ranked top 19th. *Image Source: Seshadri, Hari. "Chess Game GUI Image." http://www.hariseshadri.com. 2009.